There is no denying it, children love to play with cars. Many days, I walk into a family’s home for therapy, and I see cars strewn about their play area. Cars are versatile and an excellent vehicle (ha ha ha) for speech and language development. You likely spend a good amount of time each day, forced to sit together, with your family in the car. Using cars for Playing With Purpose is not left for the toys alone; you can use your family’s car rides to expand skills too. Picture yourself in the car. You and your kids are traveling from place to place. But what are you doing? Perhaps listening to music, playing electronics, or talking. You can amp up that drive by also practicing speech! Your biggest job in the car is driving, and your focus should be on that. But why not use that time to engage your child in practice that will encourage speech & language growth. Some of the skills you can work on with cars at home or on the road include categories, speech sounds, prepositions, vocabulary, fluency (also referred to as stuttering), descriptive words, sequencing, answering/asking questions, and the list could go on. Remember to stick to the basics when you are looking to buy cars for your children. Children learn by doing. Toy cars provide many opportunities for your kids to get down on the floor and interact, create, and move. Another reminder: get down on the floor with your toddler. Spend time in a face-to-face interaction. This is particularly beneficial for young children still acquiring language. They will be able to see your face and mouth which gives them increased opportunities to imitate. Your child must be able to see your mouth and hear your words to learn them and imitate. Use cars to work on following directions. This is particularly easy if your kids have a car track set. Give your child instructions on how to build the road. For example, you could say, “First get the blue ramp and connect it to the red track.” If you do not have a car track set, then you can also work on following directions with the other toys and items nearby. . Give directions for creating a ramp, locations to drive, and a place to make a parking lot. If your child is experiencing difficulty with fluent speech, cars are an excellent tool to describe types of speech. Talk about bumpy speech and smooth speech. Use a toy car and find something to make the car run on a smooth surface and one that is bumpy. One suggestion is to pour a bit of rice out on the table for the bumpy speech and the clean table for the smooth speech. You can also focus on fast and slow speech. Practice driving or pushing you can fast and then slow it down. Follow this up by practicing fast speech and slow speech. 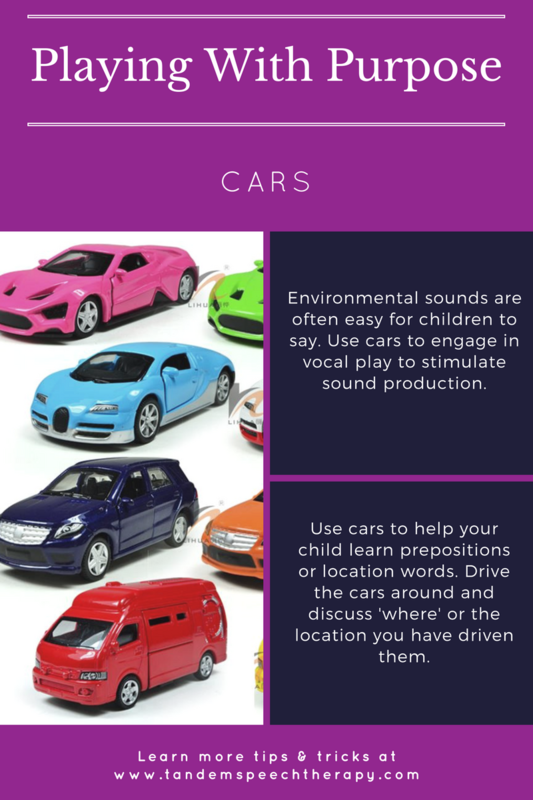 If your child is having difficulty speaking, you can use cars to work on imitating sounds. This is useful for all types of vehicles, not only cars. The vehicle sounds or environmental sounds are often easy for kids to say because they contain only vowels or early developing consonants. While playing with the cars, show your kiddo how to make different sounds for each one. The car can say “voooom,” the firetruck can say “eee ooo eee ooo”, and the train can say “oo oo” or “choo-choo.” Don’t worry if your child doesn’t imitate you right away. They may need to hear you making the sounds many times before they attempt to mimic any themselves. But stick with it, use the same noises every time you play with vehicles and they may begin to imitate. It should come as no surprise, that ‘I Spy’ is a fun and excellent game to play while in the car. Use it to work on vocabulary and descriptive terms. For an older child (ages 4 and up), describe something for him and see if he can guess what it is. For example, say “I spy something red, that’s an octagon, and has the letters s-t-o-p on it.” You can adapt your descriptions to your child’s skill level. If your child is just beginning to work on colors and shapes, you might use a lot of those in your descriptions. However, if your child is older and working on learning adjectives and more complex language, you can include more of those in your descriptions. If your child is working on mastering new speech sounds, play a word hunt game while driving in the car. Challenge your kiddo to find 10 or 20 things outside they see that have their speech sound. If your child is at an age where she can write, then supply her with paper and a pencil to keep a list of the words. This is handy for practicing later when you’re not driving. After your child has found a word and shared it, then repeat it back to the child while highlighting or emphasizing the target sound. Consider a challenge! Ask her to use the word in a sentence. Use your time in the car to talk about where you are going and what you are going to do there. This can be on your weekly trip to the grocery or while on a road trip. 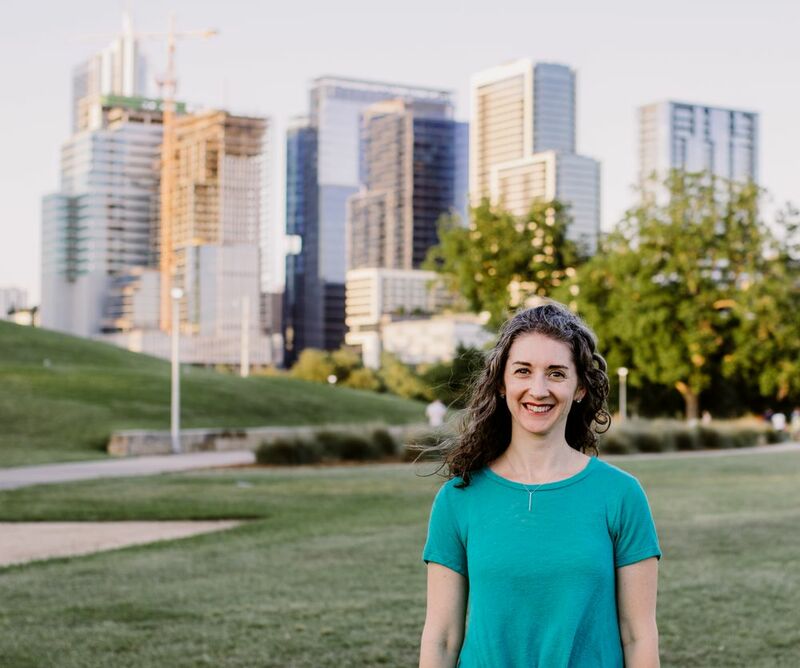 If you’re driving for a vacation, you can talk about what you packed and why you needed the individual items (i.e., You’re going to the beach, so you packed sunscreen to protect your skin.) and what activities you will do on the trip. You can discuss the sequence of your day while driving and then have your child recall the steps as you move through them. Engaging in authentic conversations are so valuable for language learning. 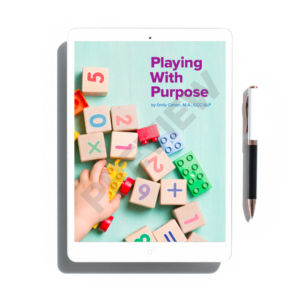 Next time you are ready to head out in the car with your kiddos or your children pull out their car toys, keep these tips in mind and be sure you are Playing With Purpose.